All practices start at 11:30 a.m., unless otherwise noted. Practices typically begin at 11:30am Central Time and last about 55 minutes. Public viewing is available at the National Naval Aviation Museum at no cost. The outside viewing area for the Blue Angels practice is located on the museums flight line north of the museum. Signs are posted to direct visitors to viewing and parking locations, including limited parking for handicapped visitors. Open bleacher seating is available and seats 1,000 people. A limited quantity of chairs are available for a fee of $3 per chair, good for that days practice session. Concessions of bottled water, sport drinks, light food, treats and merchandise are also available. Chair service, concessions and merchandise are provided by the National Naval Aviation Museum Foundation and proceeds support the museum and foundation programs. The Blue Angels are scheduled to return to their home base at NAS Pensacola on March 27. 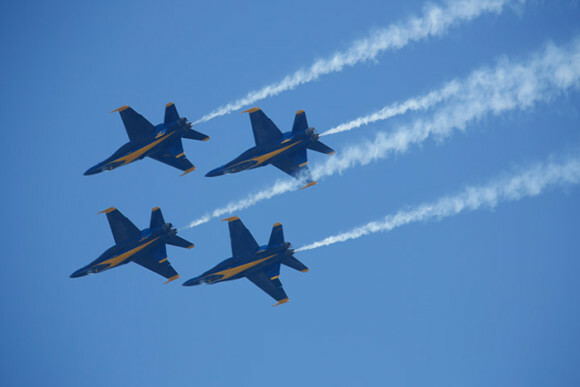 The annual Pensacola Beach Air Show is scheduled for July 13 and the Blue Angels Homecoming Air Show at the base is scheduled for November 8 and 9. All practices start at 11:30am, unless otherwise noted. Practices marked with an * will be followed by a pilot autograph session inside the museum. Times and dates are subject to change. For the most up-to-date information, visit the National Naval Aviation Museum's website.